Discussion in 'UFOs, Aliens, Monsters, and the Paranormal' started by HoaxEye, Apr 5, 2017. I'm not sure if this is the correct forum for this topic. Feel free to move around if needed. I would like to debunk one claim made by a YouTube UFO channel called Secureteam 10 in a video titled as: "6 GIANT Towers Discovered On The Moon 3/31/17". There is no need to watch the video, because it contains other, unrelated claims as well. If you enter these coordinates to Google Earth while in the moon mode, the anomalies will be visible. You will see something that looks like "towers", possibly "several miles high". These are not image artifacts. 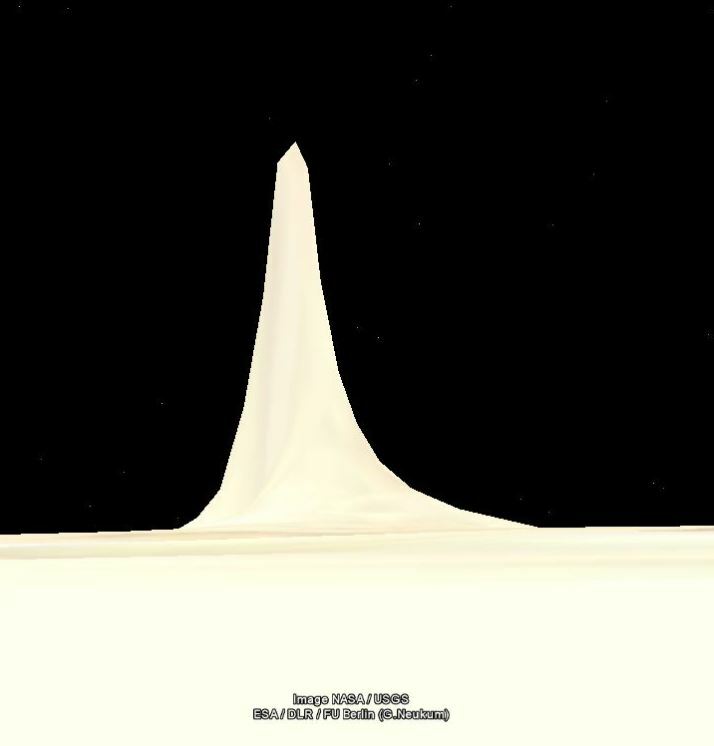 Google Earth software renders the "towers" in 3D mode, but when you zoom out they will disappear. These anomalies are not visible in any LRO images. I would like to hear your opinions on how to debunk a claim like this. It is easy to say these are software issues, but how to make sure? We know the Google Moon data sources: https://www.google.com/moon/about.html - in this case the data could originate from the USGS. USGS have stated that the data may contain errors. Google have also stated that the maps might not be accurate. Perhaps the easiest way is to ask from Google and hope they answer? Or just use a good telescope and check the area. I'm having trouble getting to the specific spots, but first instinct is stitching errors between satellite images. Thanks! I used Google Earth in moon mode (View->Explore->Moon). Copy paste one of the coordinates to the search window. Double-click the result in the history window. I have also selected Global Maps -> Lunar Orbiter Mosaic. Google Moon is very low resolution. Inspect the areas using the Lunar Reconnaissance Orbiter (LRO) imagery instead. That has images with a resolution down to 1 metre or 50cm per pixel in many areas. You have to enter the co-ordinates as decimal degrees rather than DMS format. The first location you give comes out as 22.36408056, 81.98694444. This is the video you mentioned. I don't have Google Earth on this machine but they certainly look like glitches in the altitude data, if indeed they are genuinely on Google Earth (Secureteam10 is known for hoax videos). Thanks! I know the towers are not there, but I'm unable to pinpoint the error. I have also checked several maps based on Lunar Orbiter Laser Altimeter (LOLA) elevation data, but they usually cover large areas. I will try to ask from Google. Thank you. I'm painfully aware of Secureteam 10's hoaxes (this is why I didn't link the video). But these "towers" are on Google Earth. This is why I would like to debunk this tower claim properly. Unfortunately you have to, unless you accurately present all their evidence (esp screenshots)and how they got it. For example I still cant figure out what settings he hit to make his hills look so pointy as I cant get mine pointy that much. Thank you, very interesting comment! Faulty 3D rendering of the shadows could actually explain this. I hope Google's moon team will reply. (they will not explain how to reproduce the effect). The video contains all kinds of other claims like NASA airbrushing the "towers" from LRO images, but I ignored those. - How I made the screen shot: zoomed back, eye altitude about 8 km. Tilt down (shitft + arrow down), eye altitude about 2 km. I'm using the latest version of the client. I don't think it's the shadows per se that cause the effect, it is just faulty elevation data. 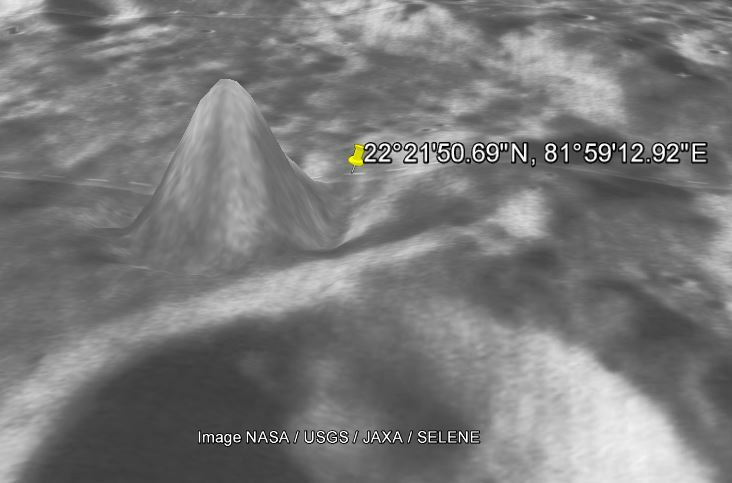 Google Earth (and Moon) makes its 3D images by draping the imagery of the surface over a digital terrain model, which is created from an elevation dataset independent of the surface imagery. The elevation dataset for the moon is likely derived from the LOLA laser altimetry data. That uses laser light bounced off the surface to measure the distance. 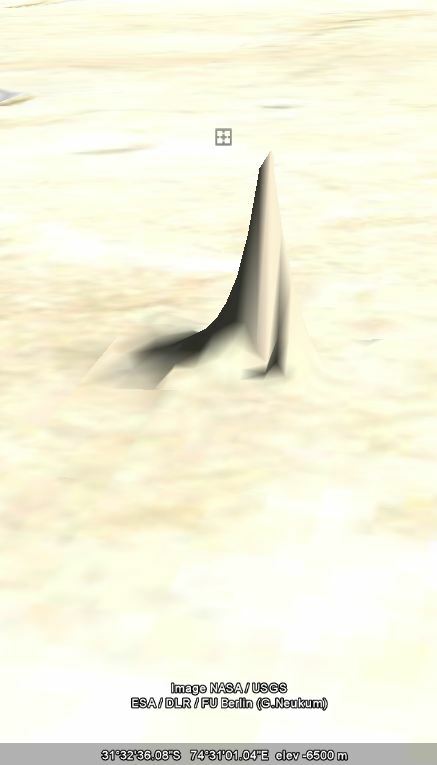 Rogue reflections or data dropouts would lead to individual data points with incorrect elevations, which the digital model would show as deep holes or tall towers. Like the Moon one, it's not really there. Now that I know how to tilt (thanks Hoaxeye).. and I changed the elevation exaggeration to 3 from the default of 1. I'm afraid to play with other settings. Why would they let you exaggerate elevations? I don't get it. Why would they let you exaggerate elevations? I don't get it. It's useful on Google Earth to highlight up and downhill portions of a walk, for instance. And it just makes the terrain pop out a bit more. ok here it is at 3 and the second pic I touched nothing but changed the exaggeration back to 1. I don't know how to measure it's height. and second coordinates, exaggeration set to 1. just changing the tilt. About @Trailblazer comment about the elevation data: this could explain all "towers" and "holes". However, USGS have used both LROC NAC (Lunar Reconnaissance Orbiter Narrow Angle Camera) and LOLA (Lunar Orbiter Laser Altimeter) data to create DEMs (Digital Elevation Models). See page 11 https://astropedia.astrogeology.usg..._VV_Report_NLSI_LUNAR_SOUTH_POLE_20130412.pdf - "There are 20,349 points that have a difference larger than ±50 m and 234,793 points that have a difference of larger than ±25 m". These data points - if Google Earth uses them - could also explain these errors. @deirdre : thanks for your trials with the "exaggeration" setting. I didn't know it affects the moon rendering. I wrote an email to Google's moon team hoping they can provide some answers. Given the age of google moon, and given that they simply say the elevation data comes from the USGS, are we sure it's not from the older Clementine data? Might be worth checking to see if any glitches came from the Clementine data. The problem is that in the past I've found glitches with Google moon that are not present in the original data Google pulled from. It's not a primary source of any of this data, it's just using pre-existing data from other sources such as USGS. If the problem can't be found in the USGS data then it ends up being just another example of why it shouldn't be used as if it were primary source material, which is what hoaxers like Secureteam always do. We don't know if the elevation data comes from the Clementine data. I couldn't find any detailed information from Google, NASA or USGS. I have not received any response from Google yet. Visible - A mosaic of images taken by the Clementine mission. This is a black-and-white version of what you would see if you were in orbit around the moon. This composite imagery was prepared by the USGS. Elevation - A lunar terrain map generated by the USGS in conjunction with the The Unified Lunar Control Network 2005, and shaded using an airbrushed shaded relief map. This map is color-coded by altitude, so you can use the color key at the lower left to estimate elevations. 4. Where did all this data come from? The data used to create the Visible and Elevation layers, as well as some of the high-resolution maps used in the Apollo layers, are courtesy of the U.S. Geological Survey. Much of the rest of the material for the Apollo layer is derived from NASA's Apollo Lunar Surface Journal. The USGS Geologic Atlas of the Moon, the Lunar Chart (LAC) Series, and some Apollo imagery are provided by the Lunar and Planetary Institute, managed by USRA. Thank you again @deirdre - the elevation data source is mentioned, but I don't know much about topography. The language used in various webpages and documents is difficult to understand (at least for me). If true, more recent data sources like Lunar Orbiter Laser Altimeter (LOLA) is not used. For what it's worth, Secureteam 10 seems to have had its YouTube monetisation withdrawn, due to numerous complaints about fake videos. He makes in the ballpark of $300,000.00 to $500,000.00 a year by just publishing UFO hoax videos. Youtube just derailed his gravy train forever. If he is all about the truth let’s see how long he keeps up his Youtube channel now that it makes zero revenue. A firm message was sent… Frauds will not be tolerated anymore. I love this. I have waited a very long time for this groundswell in support of truth and rationality. I see around the web that people are whining that this is censorship. That this is the forces of evil trying to subjugate the truth by stepping on and silencing the little guy. It has NOTHING to do with that at all. Google’s new initiative is driven by a desire to clean it’s search results of fake news and hoax sites. To make it a more valuable source of information. It is a reality that many, many websites and channels are blatant, patently, and expertly spreading fraudulent clickbait nonsense. This is not just an inconvenience but has real effects in the real world. Just look at the last federal election in the United States. This election and all the insanity that took place may be the impetus that made Google get off its hands on this one. Enough was enough a long time ago. Mr. Glockner is not going silent into the night. He has launched a Patreon account to make up for his loss of income by Youtube deeming him a constant source of fake news. So after years of cashing in on people’s gullibility to be enthralled by flashy videos. Now he want’s you to compensate him directly to lie to you. It would be funny if it was not so pathetic. I hope YouTube will not change their decision concerning channels like Secureteam 10. They don't respond to any critic (except by blocking the offending accounts) or e.g. remove any videos that have been debunked. However, I didn't start this thread because the claims were made by ST10. I don't think they even found these anomalies themselves. I wanted to debunk these Google Earth/Moon anomalies properly, but it seems challenging. I don't have the technical know-how to check the Clementine data as suggested by @Astro and Google has not replied via email or Twitter. It is easy to say these anomalies are caused by a sw bug, error in data or combination of both, but I would like to see some proof. I enjoy digging into old raw data, but unfortunately I've got a lot on my plate right now myself. I'm currently working with a local university to get some telescope tracking software up and running on a variety of telescopes, which is a pretty time consuming process or else I'd take a crack at it. It's possible that Google's process of porting the data to Google moon created the anomaly, but I'd like to look at the elevation data in greater detail to try and track down the source of the error. I don't think they even found these anomalies themselves. quick search.. heres the footage (2 min vid) from sept 2015 so yea Secure Team 10 didn't find it. I knew it! Thanks for providing the evidence. UFO hoax channels/websites rarely find anything by themselves. They spend the time making videos or blog posts (==money). I think the simplest debunk of this for people would be to point out the fact that you can't see their shadows on the Moon. Then look at the apparent size. 6km wide and 5 km high. At lunar sunset when the terminator reaches the glitch it would make a long shadow. Shadows are quite stark on the moon doe to the lack of atmosphere. These shadows should be visible to anyone with a good pair of binoculars, or a P900. Since we don't see them, they are not there. And given that these glitches are all over the moon, if they were real then you'd be able to see them about every day somewhere on the terminator. One possible next step: photograph the moon on May 6. I have a telescope, but no suitable DSLR connector. Also, spring time is often challenging for moon photography in Western Finland. Anyone else willing to give it a try? Shadows in nearby craters, no shadow here. Just in case: here is another photograph of the moon taken on Oct-11-2016 - no shadows. This was a randomly selected photo in order to prove you didn't "airbrush the shadow away"
After reviewing both videos again, it is clear that Secureteam 10 actually copied the footage from the Sept 2015 video. They never even mention the source. That is content theft. Also: I have not received any responses from Google or NASA yet. Lunar surface models are riddled with all sorts of data glitches. I've been having fun recently using QGIS to make 3D models of the surface using data from a variety of sources. This view of Hadley Rille is based on Japan's data and I've rotated the view see it from underneath.